The Sotla is a watercourse between the Republic of Slovenia and the Republic of Croatia which flows into the Sava River as a left tributary near the settlement of Rigonce (Slovenia) or Ključ Brdovečki (Croatia). The river is around 90 km long, while the precipitation area of the entire Sotla measures approximately 600 km2. The Sotla basin borders the Dravinja basin in the north, the Savinja basin in the west and the Krapina basin in the east. The catchment areas are extremely asymmetrical; while the right tributaries on the Slovenian side are larger, the left tributaries, on the Croatian side, are short and have small catchment areas. In the upper part of the basin, several smaller right tributaries flow into the Sotla, one of which is the Draganja in Rogatec; at the settlement of Podčetrtek, one of its major tributaries, the Mestinjščica, flows into the Sotla. Downstream, larger tributaries flow into the Sotla: Tinski potok, Župnijski potok, Golobinjek, Olimščica and Buča and the largest tributary, the Bistrica. After the inflow of the Bistrica, the Sotla flows along Kumrovsko polje and passes into the narrow valley Zelenjak between the hills of Bizeljsko and Cesargradska gora, and then flows south on an alluvial plain with the larger tributaries, the Dramlja and Bizeljsko. In the left part of the basin in Croatia, the Sotla flows mainly at the foot of the hills and only in certain sections intersects with smaller valleys. All the left tributaries are short and torrential with increased erosion. The larger tributaries here are the Škrnik, Kladnik and Razvor in the Kumrovec area, the Čemehovec stream in the area of Kraljevec na Sotli and the Dubravica stream. The Sotla has a steep and torrential course at its source; the gradient then decreases quite rapidly and changes into a lowland stream with large bends/meanders. In the area under consideration, the riverbeds and the sections that were arranged in the past are heavily covered with riparian vegetation; larger trees have grown in the middle of riverbeds, which in the event of high waters causes blockage with debris and consequent lateral erosion, which eventually, through the sharpening of concave parts of the curves, causes even greater meanders and changes the course of the basic riverbed. There are several gauging stations in the Sotla basin. Currently, the Rakovec gauging station, which has a data set dating back to 1926, is in operation on the Sotla. The Zagaj gauging station, which started operating in 1965, lies on the Bistrica tributary; the Sodna vas gauging station, with a data set dating back to 1989, lies on the Mestinjščica tributary. In 2017, a gauging station on the Sotla in Rogatec, which operated between 1965 and 1986, will be reactivated. Furthermore, the gauging stations currently in operation are at Hum na Sutli (data set since 2008), Sotelsko jezero (data set since 2001), Bratkovec (data set since 1993), Zelenjak (data set for the current location of the station since 1967) and Ključ (data set since 1988). Measurements of flows at the Bratkovec and Zelenjak gauging stations have been carried out since the stations were established, and at the Hum na Sutli station since 1914. Since then, only 6 measurements have been made, mainly at low flows. The Hum na Sutli, Zelenjak and Bratkovec stations are equipped with limnographs, while the Sotelsko jezero and Ključ station are equipped with water-measuring battens. The Hum na Sutli, Sotelsko jezero and Zelenjak stations are important for implementing flood protection measures. An automatic measuring station was installed at the Zelenjak station in 1979 and at Hum na Sutli station in 2008. At the Sotelsko jezero station, extraordinary measurements are taken during times of high waters. The historical data show that the mean flow at the Rakovec gauging station (water catchment area of approximately 560 km2) was 8.25 m3/s in the period between 1926 and 2014. The highest water level in the period measured was on 18th September 2010 at an absolute benchmark of 146.36 m, with an estimated flow of approximately 121 m3/s. The Sotla River is protected from the nature conservation aspect and is important for the conservation of several species of fish and crustaceans, which significantly influences the management of the Sotla and water and coastal land. On the stretch between the inflow of the Olimski potok stream to Stara vas-Bizeljsko, the Sotla runs on the Slovenian side of the Kozjanski Regional Park, which fully protects the natural and cultural landscape. 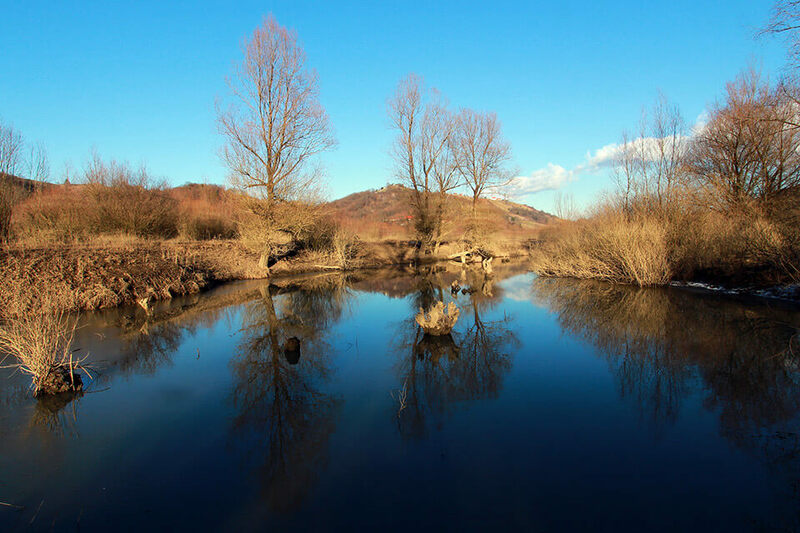 In the area of the Jovsi Ornithological Reserve, which extends between the Župelevec–Dobova road and the Sotla in the municipality of Brežice, flood and marshy areas are preserved. In the last twenty years, only maintenance works have been carried out on the Sotla in terms of hydrotechnical arrangements, and even these to a minimum extent. Along shorter stretches through settlements and in border crossing areas, the mowing of banks and partial removal of vegetation is implemented; in areas where damage occurs due to the erosion activity of the water, local protection of the banks is implemented to prevent the spread of erosion and damage to the surrounding land. In the 1950s, the Sotla riverbed from the outflow into the Sava to the Figarov most bridge in Čemehovec (km 14+800) was regulated during the construction of the Savski Marof – Stranje railway, Subsequently, smaller individual measures to stabilise the riverbed (sills, longitudinal buildings, consolidation of banks) were implemented, on both the left and right banks. Some of these arrangements are still functioning. The entire area along the Sotla, from Dobovec to the Sava, is at risk of flooding. The regulations in some urbanised areas have limited the extent of floods or reduced their frequency. Tributaries flow into the Sotla through relatively narrow valleys. Along the Mestinjščica, Zibiški potok, Tinški potok, Buča and Bistrica streams, during the high waters of the middle and longer return period (above Q5), agricultural areas and individual small settlements or individual objects are subject to the worst flooding. In the past, the main road at Podčetrtek was often flooded and, during annual high waters, the entire plain on each bank was flooded. part of the area of Rogatec near Sotla. the area up- and downstream from the Hum na Sutli border crossing, where several residential and commercial buildings and a kindergarten are at risk of flooding. Among the flood protection measures on the Croatian side, it is necessary to mention the left embankment at Ključ Brdovečki, with a length of 3,480m, and the left embankment in the settlement Gmajna (Kumrovec), which is 800 m long. A left embankment of the Sotla is located along the railway Zagreb – Ljubljana (mil. marking of the embankment km 3+480 to km 2+138). The embankment protects the area of Ključ Brdovečki from floods with a return period of Q50, with a safety super-elevation of 50cm. Downstream from the mil. marking km 2+138, there is a parallel embankment along the Sava, which is dimensioned for high waters with a return period of Q100 and a 120cm safety super-elevation. 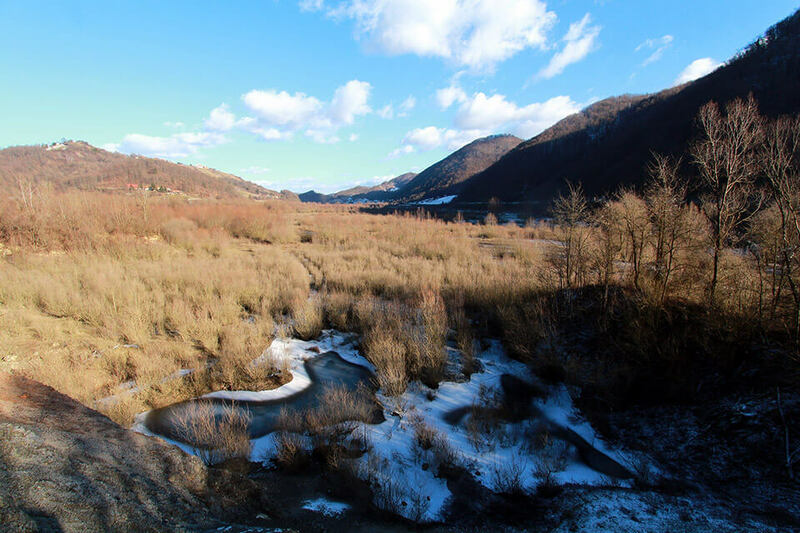 The embankment at the Gmajna settlement is a naturally arranged deposition of material excavated from the Sotla (in the 1970’s), which is in the form of a high-elevation embankment and protects the settlement from high waters; however, its technical characteristics are unsatisfactory. for fishing and tourist recreational activities. In the early 80s, due to the poor quality of water, the only permitted use was retaining the high waters; in 1988, after several incidents (death of fish) in the Sotla, the lake was finally completely emptied and is currently operating as a dry retention basin. In recent years, there has been no need for a drinking water supply, since this is regulated on the Croatian side through the “Zagorski vodovod in Hum Vodoopskrba i odvodnja” system. The accumulation is located upstream of the inflow of Mestinjščica into the Sotla. The length of the accumulation is approximately 6 km in the valley, and the area is 195 ha. Two barriers are in place: the upper Prišlin (which prevents the upper part of the valley from becoming marshy) and the lower Vonarje. The Vonarje barrier is constructed as a piled ground barrier, 12.0m high. The volume of accumulation at the benchmark 207.50 (the benchmark of the overflow) is 8.7 106m3.